WWI Trio - Gunner G. Bowen, RNAS/RAF. 1914-15 Star (GNR. G. BOWEN. R.N.) and British War and Victory Medals (GNR. G. BOWEN. R.N.). Naming is officially impressed, crisp detail, beautiful patinas, extremely fine condition, board mounted. Also included is a duotang folder with his military biography and two ship photographs. Footnote: George Bowen was born on Valentine's Day, February 14, 1877. 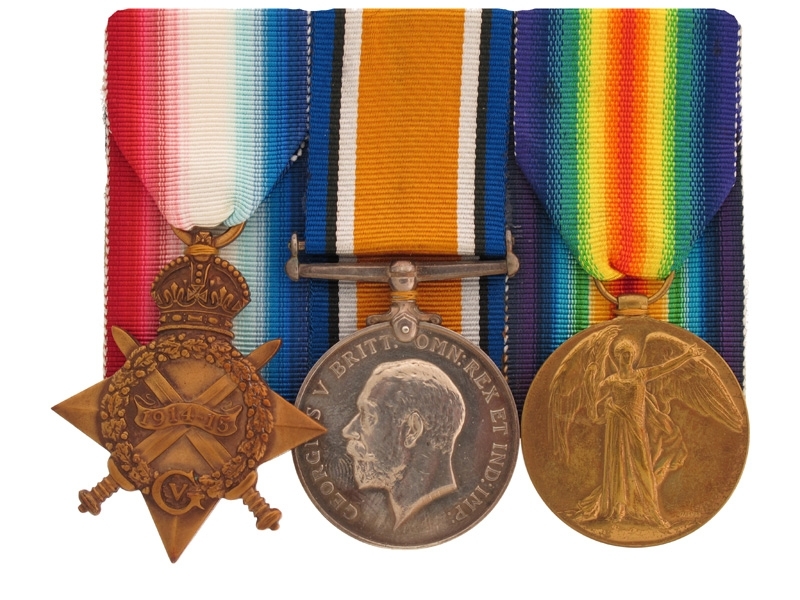 He achieved the ranks of Gunner, Warrant Officer (2), Warrant Officer (1) and Chief Lieutenant between 1904 and 1918. He was then named Flight Lieutenant in the Royal Air Force on August 1, 1919. Pre War, he served aboard H.M.S. Pembroke, Exmouth and Halcyon. During WWI, he was with the Royal Naval Air Service. In early 1916, he was in London at the White City Stadium, an R.N.A.S. Training School. In late 1917, he was at the Wormwood Scrubs Airship Station, also in London. To have earned the 1914-1915 Star and the Victory Medal, he had to have served in France and Belgium or on airships over the North Sea. He is shown in the Navy Lists as of November 1920 as a Commissioned Gunner, the same rank as Chief Gunner. He transferred into the newly formed Royal Air Force in August 1919, where he carried on his career. He was placed with 45 Squadron in Egypt, May 20, 1921, then in RAF Headquarters, No. 1 Group, May 14, 1924 and then to No. 1 Store Depot in London, as a Qualified Air Armaments Officer on November 10, 1924. After his retirement from the RAF, he was a civilian worker for the Air Ministry between 1938 and 1945 and retired as Equipment Officer in Aeronautical Production. In 1950, he is not shown in any lists so he probably died in 1948 at the age of 72.